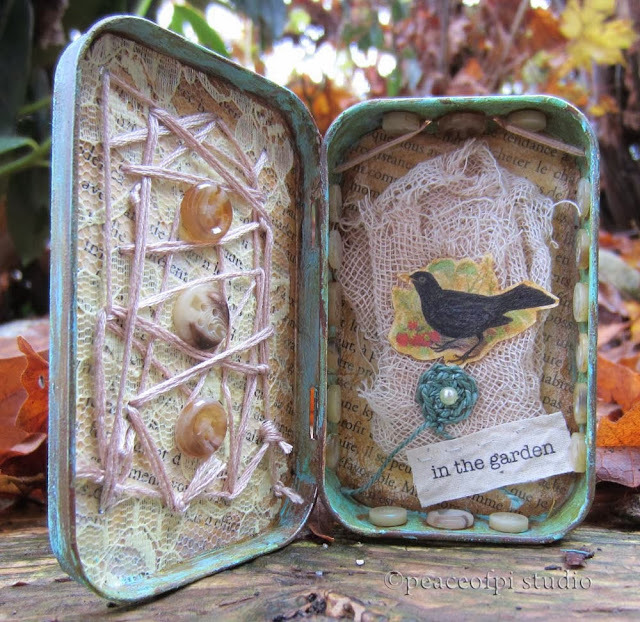 In the garden is a mixed media assemblage. This small altered tin features fabric, lace, paper, paint, buttons and embroidery floss all surrounding a sweet black bird. To create this piece, the tin was aged and painted and a nice green patina was added. A book page serves as a background for the lace, floss and button embellishments. The central image of the blackbird sits above a tiny teal nest with a pearl bead egg and the phrase, in the garden. Altered tins make beautiful tiny treasures: providing inspiration, encouragement, and expressions of gratitude.